1. How did you and your husband get into $80,000 of debt? $80,000 of pure student loans. We met in college and attended the same private Christian university in Oregon. We absolutely loved our time there but it came with a big price tag! We got married in July 2015 right after I graduated college, and have been paying off our loans aggressively every since. 2. What did both of you go to school for? My husband, Jacob, has his B.S. in business management and marketing and I have my B.S. in business accounting. Thankfully, we both have jobs in our fields! 3. What strategies did you use to pay off so much debt this fast? In college, we took Dave Ramsey's Financial Peace University (FPU) class. We learned all about the debt snowball through Dave and for the most part, used that method to put about 70% of our monthly income to loans each month. 4. A lot of couples struggle with talking about debt and coming up with a plan! Was it hard for you and your husband? Thankfully, this was not hard for us. We took FPU while we were dating in college and were open in talking about our finances then. 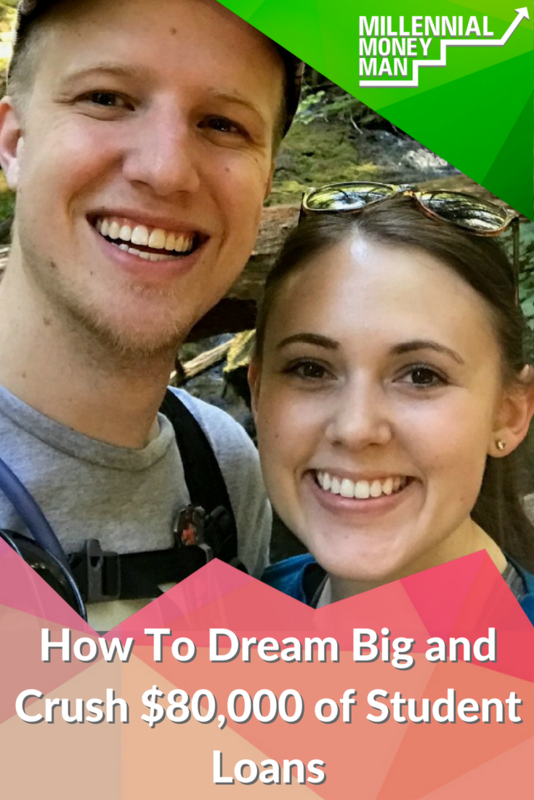 We dreamed about how we wanted to live our lives when we were married and what that meant for our family in the future as well. We were excited to share our goals and dream about our future. And that meant that we had to come up with a plan: paying off debt ASAP! 5. You've mentioned that you're cutting back on your expenses. What are you having to give up? We have given up a lot in the last 2 years while paying off debt. We lived in a small one bedroom apartment our first year of marriage but moved in with my parents after our first anniversary. Therefore, we've given up a lot of our own personal space, but have been so grateful that my parents offered to have us back home to kick these loans to the curb! This has been the huge game changer for us. While we still pay rent, we've been able to put about 70% of our monthly income straight to loans. We both drive old cars that we own free and clear. I drive a '98 Camry and my husband drives a '01 Tacoma. As all my 20-something friends are passing me up in newer and nicer cars, I just keep driving my reliable Camry. She may not be the prettiest, but she is paid for and gets me from point A to point B! Getting out of debt doesn't mean that you have to live under a rock, but we budget for only 1-2 outings per month and offer other free ideas that we could do with our friends. We've also said “no” to ourselves and our desires for a nice vacation or expensive hobbies or items. We're excited to start doing some of those when we're debt-free! One thing we do not give up while paying off debt is giving. We've always found giving to be the first priority in our budget, and as Christians, we still tithe to our local church. 6. What has been the hardest thing about paying back your debt so far? The hardest part of paying off debt has definitely been the sacrifice and saying “no” to a lot. It's hard sometimes to get past my own insecurities of driving an almost 20-year-old car and living with my parents when I see friends on social media who are buying brand new cars and taking that vacation to Europe. The thing I have to remind myself is that what we see on social media isn't always true. That car was probably financed and that trip to Europe may have been put entirely on a credit card! Jacob and I are definitely learning how to be patient and stay focused in our own lane as we continue to pay off debt and work on our goals. 7. You set a debt-free date! What are you going to do for the big day? We will be debt-free this October! It's crazy that it's this soon and that all our hard work for the last two years has paid off. We will have paid off $86,000 of debt (including interest) in about 27 months. Last summer, we thought we'd still be in debt past 2018, so we planned a cruise for October 2017 because we knew we needed some sort of break or treat to look forward to since we had been so diligent in paying off debt (our first real vacation since our honeymoon 2 years ago). But as our debt-free date got closer and we minimized our expenses and our income increased, we realized that our debt pay off date would actually be during our cruise! Our final payment will be withdrawn on our pay day as we're on our cruise. It worked out so well. How crazy is that?? As Portland, Oregon natives, we don't get much sun, so we're looking forward to a Caribbean cruise in October. 8. Do you have any big financial goals now that the debt will be gone? Our next goal is to build our savings account. We want to have a fully-funded emergency fund of 6 months of expenses and then save for a house. It's always been our dream to be home-owners. When we got married, our goal was to be debt-free and have a house before we have kids, so hopefully, we'll be able to start a family in the coming years as well! 9. What made you want to start your blog? Nine months into our debt-free journey, I realized that I had a great passion for personal finance and budgeting. I actually love this stuff and make it a game to see how much we can pay off each month! I also saw how crippling student loan debt was for friends my age just graduating college, and wanted to help encourage people in our position who didn't even know where to start. Jacob and I aren't experts, but we have been through a lot in the last couple years that I hope could be some sort of help or encouragement to other millennials. 10. If you had one piece of advice for couples that are staring at a lot of student loan debt, what would it be? My advice would be first to dream together and then create a game plan to reach your goals. What do you want your bank account to look like in 5 years? What kind of house do you want to live in? What car do you want to drive? Where do you want to travel? Dream big and then figure out how you're going to get there. When you have an end goal in sight, it makes it a little easier when you are in a season of sacrificing just about everything now to achieve those goals in the future. What's the biggest sacrifice you've made to pay off debt? Awesome to see this wow!! I can’t wait to be able to post a similar post in a few years – my great war of debt has begun! LOL seriously! I find it so annoying when people say that and some of us are out here grinding! I’d love to share a story or something with your readers – do you allow guest post? Wow, that’s a lot to pay off in such a short amount of time. Good job sticking with it, that’s awesome. Booking the cruise was a good idea IMO (to help you stay sane) and the fact that it’ll be a ‘reward’ now makes it even sweeter. What are your plans once the debt’s all paid off? Will you continue living with your parents for a while, or move out and rent while you look for a home? If you can swing it living at home and nobody’s going crazy yet, that’s such a great way to save money! Great job getting ahead financially, and good luck on the remainder of the debt. Enjoy that cruise!! Thanks, Dave! Right now our plans after we’re debt free are to stay with my parents through the winter to save for a down payment on a house! We’re hoping to buy soon, and staying with my parents will help us to be able to save like crazy! Living with them has gone really well and we’re so thankful for that! Congrats on such an amazing debt payoff story! Incredible to see how much you’ve paid off in such a short time. Enjoy your cruise! Yeeeees. I don’t agree with everything Dave Ramsey says, but his debt snowball method really does work. That’s how we paid off our credit cards relatively quickly. We really had to take a hard look at what we were prioritizing and how we spent our money. It does require some adjusting once you realize that we’re encouraged to spend money on far too many stupid things. Moving to the middle of nowhere to work and earn a better income and receive loan repayment through my employer. That has been my sacrifice. I am on track to pay down nearly 140,000 of student loan debt which will have taken place over approximately 24-26 months. It was a huge sacrifice and has taken me out of my comfort zone more than a few times, but it will have all been worth it when I see a zero balance on my loans in a few months!! Great story! Sacrificing 2 years of space is going to put them in an incredible financial position going forward and I bet they wouldn’t trade it for anything! Congrats Marissa & Jacob! Way to rock the debt payoff plan and execute! Super inspiring! Love that you encourage couples to dream together… that implies communication and doing it TOGETHER! Love it. Thx for sharing Bobby! Great story!!! Thank you for sharing and best wishes for the future! That’s great you are working towards paying off your student loans. However, I have to admit it felt anticlimactic when mine were finally paid off. There was no party or congratulations. The good news is that you will be able to supercharge your savings after you are debt free.